My Mac Mini, purchased in 2009, was beginning to choke on simple tasks and be generally slow as molasses, and I was considering retiring it. It was attached to our TV as our media player, but after trying Apple TV, I decided the latter was far superior, especially after the addition of Hulu+ to the mix of iTunes, Netflix, Youtube, Vimeo, MLB, and Photostream. I had been using my MacBook Pro as my desktop, but found it to be more useful as an actual laptop, so I moved the Mac Mini to my desk but found it to be, well old. If it were a Windows based system, there would be no question where it would be headed -the recycling bin at Best Buy after I tore out the hard drive. But after I investigated the Mini, it turned out to have two problems -the 160 GB hard drive was nearly full and was a lowly 5400 RPM disk. Also, the stock Mini came with 2GB of RAM. The hard drive would need to be upgraded and I found a nice 750GB SATA drive spinning at 7200 RPM which would speed things up nicely and allow me to create a generous Boot Camp partition (lets me run Windows). The RAM was upgradeable to 8GB. 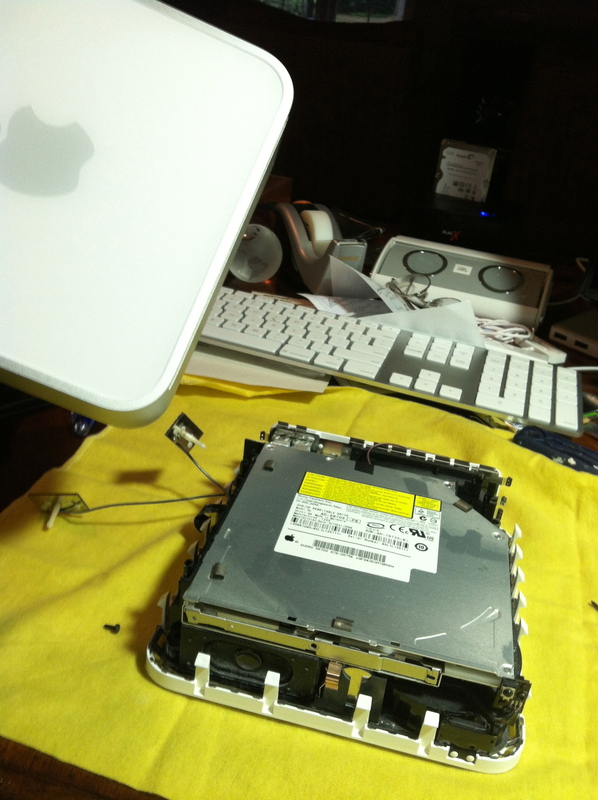 Both upgrades ended up totally $150 from Other World Computing which specializes in upgrade packages for older Macs. To answer the obvious question -I declined using an SSD drive because it would be over $200 for a reasonably sized drive, and I wanted to keep costs down. The instructions for surgery are on the internet -the OWC site’s videos are comprehensive, but start with the caveat that the upgrade should be done by a professional. If you can replace the batteries on a toddler bath toy, you can kick this. The upgrade was very easy and took all of 10 minutes after cloning the original drive to the new one (using Carbon Copy on trial, does need a SATA reader) which took a few hours. Booting up was noticeably quicker and the computer seemed happier after the brain transplant. I also took the opportunity to blow out a lot of accumulated dust in the machine. After surgery, the “About This Mac” screen shows the new RAM. The great thing from doing this was setting up Windows 7 in a Boot Camp partition which gives you a clean install of Windows. 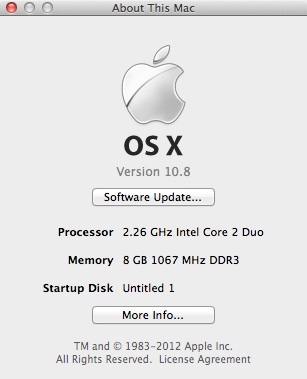 The Mac Mini is a GREAT Windows 7 machine, and runs very snappy. One of the things I regret about the move to increasingly hermetic systems like iPad and MacBook Air and the recently released Retina Macbook is the loss of the ability to upgrade the Mac. This Mini is now good for another 3-5 years as long as Apple supports the upgrade to this system. As a Windows machine, it will probably not get Windows 8, but Windows 7 will be supported for the next 7-10 years if Windows XP is to be used as a rubric.